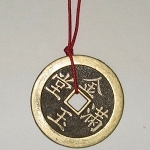 "The Large Chinese Coin on Red Cord is good quality and I got an unexpected check." Phyllis from Illinois. What are you saying about Feng Shui Consultants of Boca Raton and Zen Appeal? We'd love to know - Contact Us.